It’s clear our business environment continues to change and we have a new definition of what normal means: nothing is normal. We are in era of rapid, disruptive and impactful change. The coming years will bring further turbulence, shaking out our industry and setting the course for the next 20 years and beyond. Market cycles will continue to evolve and will be impacted differently than they are today. For example, in the past, market cycles have been shaped by globalization and emerging economies. In the future, shipping market cycles will be impacted by technology and regulations. The four biggest challenges facing shipping today are digitization and connectivity; cyber security; emissions reduction and efficiency improvements in operational performance. Recognize there are three levers to pull to achieve competitive performance: Identify and develop talent; Manage and rationalize technology; Choose the right operating model that allows for greater horizontal thinking. How has ABS ‘weathered the storm?’ Specifically, how is the ABS of 2018 most different from the ABS of 2013? How is it still the same? ABS has adapted to the changing business environment by more closely aligning our operations and right-sizing with industry demands. As technology and regulations move the industry to risk-based, data-centric, cyber-influenced decision making, our team today looks different. We are re-shaping our workforce balancing traditional and non-traditional skill sets from professionals who are able to make the right data-driven, techno-economic and risk-based decisions while embracing disruptive technologies. Our team is now delivering a range of work not possible in 2013, including industry-leading projects with shipowners, regulators, equipment manufacturers, governments, academia and others on topics such as wearable technology, drones and unmanned systems, data strategy validation, condition-based health monitoring, structural digital twin development and predictive analytics. Our digital journey is a key part of our FutureClass strategy to transform the traditional survey process, and continues program developments already underway. Key foundational building blocks, such as the ABS Freedom survey workflow system, ABS e-Certificates and our industry-leading ABS Cyber Safety program, have built a solid foundation from which we are continuing to develop game-changing products and services. Amidst all the changes, ABS’s mission – the same since its inception in 1862 – continues to guide everything we do; we serve the public interest as well as the needs of members and clients by promoting the security of life and property and preserving the natural environment. 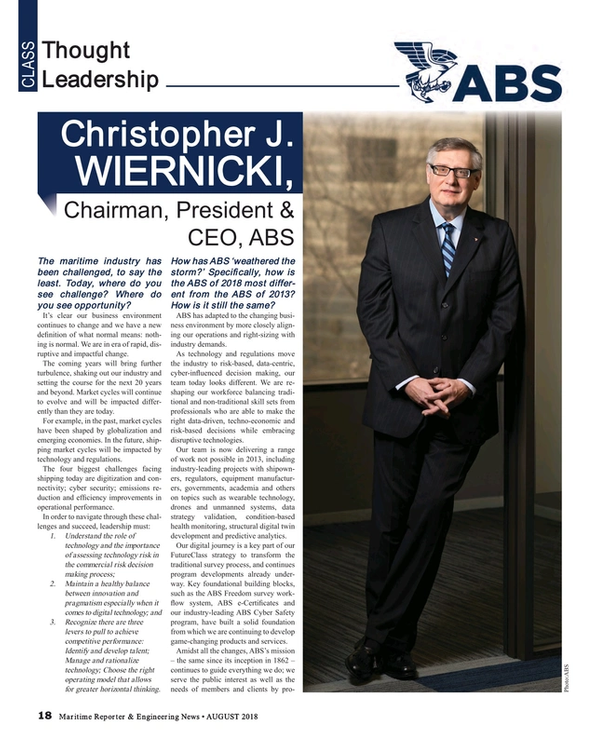 ABS has always been and remains committed to setting standards for safety and excellence. Every day we work alongside our industry partners tackling the most pressing technical, operational and regulatory challenges so the marine and offshore industries can operate with enhanced levels of safety, security and responsibility. That will never change. In many respects this is a transcendent time in maritime history. If you had to pick the single trend that you feel will have the biggest impact on transport at sea in for the coming generation, what would that one trend be and why? Performance improvements going forward will most likely be driven primarily by digital technology emphasizing data collection and analytics, not by traditional technology. The foundation for this has been in place for some time, such as on-board sensors that already stream an ever-increasing amount of data about engine performance, hull structure response for tail shaft and bearing wear, oil temperature and condition machinery operation, vibration and the functioning of all control systems. What is new, is our industry’s growing ability to drive insights from the data. Our new normal going forward will be more data-intensive, focusing on better asset management decision making, nut just better equipment or better application of physics. Increased sensors and monitoring, coupled with data analytics and machine learning, will drive a new generation of predictive and preventive maintenance practices. This could, combined with improved robustness and reliability of systems as well as additive manufacturing (e.g., 3-D printing) offer a step-change in how ships are operated and maintained. The reliance on automation, data and connectivity will require robust cyber security to be incorporated from design to operations. Cyber and software will become the third leg of the safety stool, joining structure and machinery, and adding a new dimension to a vessel’s safety system, recognizing that software is the safety system no one sees. In looking at digitalization we obviously focus on the ships, the fleets and fleet operation. But looking at this through the ABS lens, how is the ‘digital revolution’ impacting how ABS conducts its own business, in the field, in the office? Within ABS, we are well into our digital progression as we transform our survey process from connected to data-driven to predictive surveys. Today, the connected surveyor is empowered through mobility with applications that enable both surveyors and clients to better manage the survey process. Through a consolidated data model and a cloud infrastructure, clients have access to an expanded client portal and mobile applications to access to e-certificates, vessel information and the status updates to streamline the survey process. 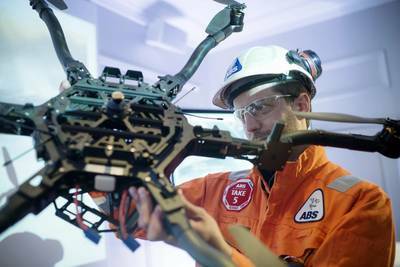 Advanced inspection technologies such as drones, robotics and wearable technology offer additional efficiencies for our clients and reduce risk for surveyors. ABS Surveyor with Inspection Drone. (Photo: ABS)Using these tools, our surveyors may collaborate in real time with remote engineering experts onshore. The application of sensors for remote monitoring facilitates condition-based inspections. Looking to the near future, as more and more data continues to be collected, we will move towards a data-driven survey. Data analytics will be applied to inspection results and vessel data (structure and equipment) to assess the condition of the asset prior to attendance. Mobility will be expanded to the entire ABS ecosystem, so all stakeholders have secure and relevant access to data to manage design review and survey before and after construction. The remote centers of excellence onshore will be expanding to include – not just experts in engineering – but also data scientists. Inspections of high risk areas will be transferred to robotics and our clients will experience less inspection-related down time as surveys move from calendar-based reviews to an annual assessment. Ultimately, the survey process will become more predictive and less intrusive. Fueled by data, surveys will be driven by predictive analytics, only focused on those areas that require attention. The vast network of data feeds that are entering a vessel survey are enormous and includes increased and multiple sensors, artificial intelligence and machine learning development. To continue progressing and moving forward, we must be able to correlate and assess all the data and vessel conditions, and be able to analyze large amounts of data in real time and make predictive decisions rather than calendar-based decisions. The fusion of technologies in cyber-enabled business is blurring the lines between physical, digital and biological spheres – connecting people, systems and data. Digitization and connectivity will transform the marine and offshore industries through sensors, as well as data and autonomous systems, improving both performance and compliance. Data and digital technologies will inform the surveyor in new and as yet undreamt-of ways, but these will never take the place of a surveyor’s judgment or authority. They will, however, enhance the surveyor’s job through a new team effort, in which a qualified data scientist will be in the background, providing a risk-based advisory assessments that will assist the fulfillment of the surveyor’s mission. This, in turn, will bring a new era of collaboration on safety between class and industry. The digitally-informed survey of the future will involve a new kind of teamwork. Remote data scientists will be part of local survey teams, developing risk-based vessel advisories and digital models for surveyors. Further, there will be a new era of collaboration on safety between Class; and the industry. Clients are sharing an unprecedented amount of operational and maintenance data, making digital models possible. Class, having a truly comprehensive view of vessel risks, will then be able to help operators make better-informed decisions about their assets through an independent lens. Ultimately, the world fleet will be in better physical condition and operate at better efficiency overall. How is ABS investing today to prepare for its tomorrow? We are investing in people, systems and technologies; however, it is important to understand that no matter how advanced our technology becomes, how fast it evolves and how fast we adopt it, digitization is an enabler to our industry and is merely a tool for transparency. It certainly has the potential to create great value, innovation and disruptive thinking, but it will always lack institutional knowledge, social skills and common sense. Our new norm is ultimately about people – people are the engines that drive our company and talent is the energy source or fuel that makes it happen. Analog talent is quite different from digital talent. New technology is redefining our talent needs relating to new types of skills such as data-driven decision making, predictive data analytics, systems and design thinking, integration of engineering and cyber awareness and impact. ABS launched its strategic ABS FutureClass plan in 2017 to accelerate its digital evolution and chart its journey towards the future as a data-driven, innovation-inspired, agile technology company dedicated to sustaining and strengthening its leadership role. The ABS FutureClass plan expands our ability to fulfill the ABS Safety Mission, providing new tools that inform classification services and enable us to work collaboratively with our clients to align asset maintenance practices with class requirements.